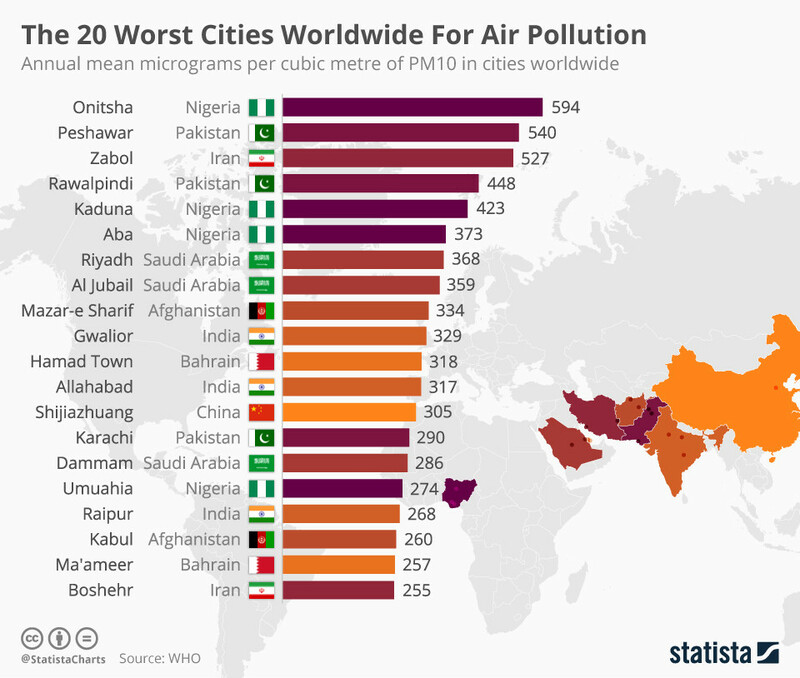 More than 90% of people worldwide have to breathe polluted air. Fossil fuels are the primary cause. The people most likely to suffer are those who live in crowded places where the shift to cleaner forms of transportation and energy has not happened or is happening too slowly. This is particularly evident in some areas of Asia, where smog hangs over cities and seeps into the countryside, and even into people’s homes. Air pollution contains fine particulate matter that can enter the body and get into the lungs, causing respiratory and cardiovascular issues such as asthma attacks and irregular heartbeat, increased oxidative stress and inflammation, and chronic disease like diabetes and cancer. In fact, air pollution is responsible for more 7 million premature deaths worldwide, according to the World Health Organization : the single largest environmental health risk. The only viable long-term solutions are accelerating the transition to a low fossil carbon economy and reversing climate change. But what can people do in the meantime to protect their health? According to recent studies, your nutritional intake might come to the rescue. Researchers have found that good nutrition can fend off air-related illness and may even reverse the negative effects of fine particulate matter. If you’re one of the billions of people waiting for a breath of fresh air, that means you may want to up your vitamin intake. Professor Jinzhuo Zhao, from Fudan University School of Public Health, China, who studies the impact of a particulate matter called PM 2.5 and explores nutritional solutions, says: "The findings of a number of human studies are encouraging and a good basis for further work to determine optimal combinations of nutrients to prevent or reduce the impact of particulate matter on different aspects of health." Some of the top nutrients thought to make a difference are long-chain polyunsaturated fatty acids like omega-3, as well as vitamins C and E. Oily fish like salmon is a great source of omega-3, which can reduce the risk of cardiovascular disease and stroke. Vitamins C and E, which are found in many fruits and vegetables, nuts and vegetable oil, are powerful antioxidants that help the body fight free radicals and restore its regular inflammatory response. For people who don’t get enough vitamins through food (and many of us don’t), supplements are a good source of health-boosting nutrients. Of course, vitamins and omega-3 are only part of a solution. This does not reduce the responsibility of polluters, nor of law-makers and authorities who must legislate and enforce policies that stop pollution. It means that governments, scientists and the private sector should work together and continue research in this area because improving nutrition is easy and inexpensive, and it may be one way to help the billions of people who are waiting with bated breath, sometimes quite literally, for air pollution to stop.